The last ultra-buzzy, household-name tech company has left the building. Twitter's initial public offering last week ended the string of hotly anticipated U.S. tech debuts that began in 2011. 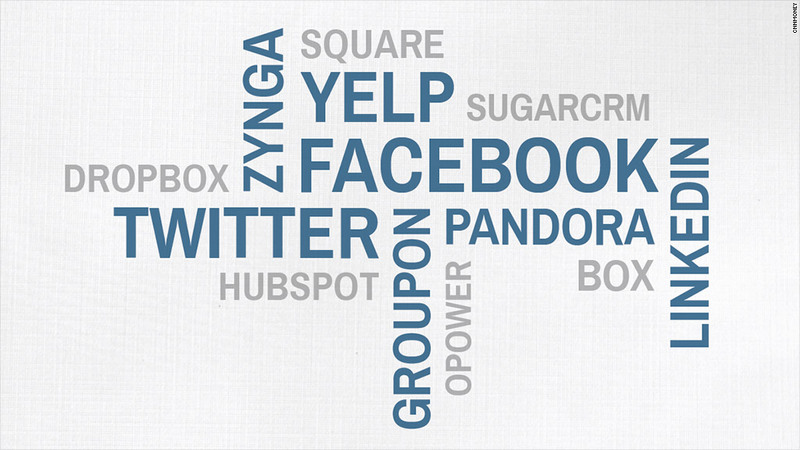 Facebook, LinkedIn (LNKD), Groupon, Yelp (YELP), Pandora (P) and Zynga have all gone public ... with varying degrees of success. All of those companies, like Twitter, are fairly well-known among average consumers. But the upcoming slate of business-focused tech IPOs won't feature such huge, recognizable names. The social media IPO boom of the past two years has been exciting, especially given that the tech IPO market had been essentially frozen since Google's (GOOG)2004 debut. But what made this spate of offerings truly unique was that companies like Facebook and Twitter drew mainstream attention to Wall Street. Users of these and other social media services wondered if they should put their money where their mouth is and buy the stocks. Twitter (TWTR) was the last tech IPO that's likely to incite that kind of mass interest anytime soon. Instead, nearly all of the rumored upcoming tech IPOs are companies whose main customers are businesses. File-sharing services Box and Dropbox, customer relationship software maker SugarCRM, green-tech firm Opower and marketing software firm HubSpot are some private companies that experts believe could go public soon. But none of them have actually filed for an initial public offering as of yet. These companies are important -- and in some cases have better business models than social-media firms. But none are household names that will elicit breathless excitement from Main Street. "When it comes down to it, how many technology companies really are well known names to consumers?" said Kathleen Smith, principal at IPO fund manager Renaissance Capital. "Most true tech -- not like Facebook, which is essentially an advertising company -- is about the back-end technology that consumers don't know about. Those will never be household names." That may be a good thing for these corporate-focused companies, given that widespread interest adds a different dynamic to the IPO process -- and it isn't always in a positive way. The widespread attention for social media stocks has some wondering if that corner of the tech market is in a bubble that rivals the early 2000s. Plus, the increased scrutiny from investors has also led to volatile price swings for Facebook (FB), Groupon (GRPN) and Zynga (ZNGA) since their market debuts. But there is one notable, partly-consumer-focused tech company that could generate a lot of attention: Square, a payments startup from Twitter co-founder Jack Dorsey. Reports surfaced last week that Square has discussed a 2014 IPO with bankers. While rumors of IPOs from a handful of other consumer tech names are also swirling around, they may be fueled more by wishful thinking rather than actual plans for an upcoming offering. Social image-collection site Pinterest is busy raising money at a valuation of nearly $4 billion, but the company isn't making money yet. Pinterest only began experimenting with ads on the site last month, a sign that the company is at the very beginning of figuring out a business model. Pinterest's CEO has continually denied rumors of an impending IPO, as have executives from apartment-rental site Airbnb, notetaking service Evernote and taxi-hailing app Uber. But these firms could simply be playing coy, given that they're growing rapidly in a market that's eager for more consumer tech IPOs.